Glencoe is a village in western Scotland. It lies in steep-sided Glencoe valley, in the Scottish Highlands. Scotland’s most famous glen is also one of its grandest. The area is known for waterfalls and trails that climb peaks such as Buachaille Etive Mor and Bidean nam Bian. The approach to the glen from the east is guarded by the rocky pyramid of Buachaille Etive Mor – the Great Shepherd of Etive . The modern road leads over the Pass of Glencoe and into the narrow upper glen. The southern side is dominated by three massive, brooding spurs, known as the Three Sisters, while the northern side is enclosed by the continuous steep wall of the knife-edged Aonach Eagach ridge, a classic mountaineering challenge. The road threads its way past deep gorges and crashing waterfalls to the more pastoral lower reaches of the glen around Loch Achtriochtan and the only settlement here, Glencoe village. A few miles east of Glencoe, on the south side of the A82, is Glencoe Mountain Resort, where commercial skiing in Scotland first began back in 1956. On a hot summer&apos;s day the River Etive contains many tempting pools for swimming in, and there are lots of good picnic sites. 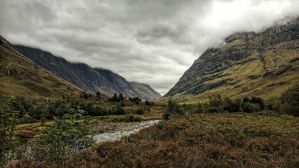 Glencoe was written into the history books in 1692 when the resident MacDonalds were murdered by Campbell soldiers in what became known as the Glencoe Massacre. In the village, Glencoe Folk Museum occupies 18th-century thatched cottages, with displays on local heritage and the Glencoe massacre of 1692. Glencoe is full of majestic views and interesting history, and these hostels provide an excellent base for exploring the area. 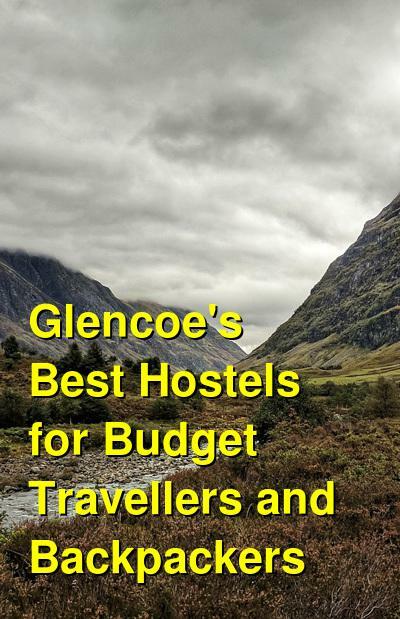 How much do hostels in Glencoe cost? A warm welcome awaits you at this rural and rustic accommodation in the heart of the valley of Glencoe. The hostel (standard rooms) is an original highland croft sleeping up to 26, in 4 bedrooms of either 6 or 8 beds. During quieter times you can book sole use of a 6 bedded room for either 2 or 4 people. It has a dining room, kitchen, and lounge with open log fire. This is available only to guests staying in the hostel building. The Bunkhouse offers more basic rooms than the hostel, although it has recently been refurbished. The bunkhouse sleeps 16 in 1 room of 8 and 2 rooms of 4. It has a central communal sitting/cooking/eating area. The bathroom is accessed externally. Guests staying in the bunkhouse do not have access to the hostel building with the open fire etc. In both properties bed linen is provided and beds are made for your arrival. Bunkhouse guests do not have use of the hostel facilities and vice versa. A basic continental breakfast is available for a small additional fee. The property is easily accessible by car or bike and 1.5 miles from the bus stop in Glencoe Village. The views from the facility are fantastic. The property is set in 2 acres of land, surrounded with native woodland, which is home to Roe and Red Deer, wild birds, and the occasional Pine Marten. Come rain or shine, the scenery is breathtaking, with views of the ridge and the Pap. If all night partying is your thing you’ll find it elsewhere, if you want fantastic scenery and love the outdoors this is the place for you. Bike hire is available in the village. Free parking, Wi-Fi, and linens are included and towels are available for hire. Set in one of Scotland&apos;s most spectacular and historic glens, not far from Glencoe village, this alpine-style youth hostel provides an excellent base for walkers and climbers of all abilities – not just in summer but all year round. Glencoe Youth Hostel is perfect if you’re going for a scramble in Coire Gabhail – the dramatic Lost Valley – or tackling Britain’s finest ridge walk, the Aonach Eagach, which ends at the hostel. Visit the Glencoe mountain resort for skiing and mountain biking or cycle the Sustrans path to Oban. Or simply relax and be inspired by the dramatic scenery and history of this famous glen. Popular with walkers, climbers and families, the hostel offers private en-suite family rooms as well as great value shared accommodation. There’s a large open plan kitchen/dining room with generous cooking facilities and ample dining tables, and, we&apos;ve been told, one of the best drying rooms in the Scottish highlands. Dogs are welcome at Glencoe, for a small fee, when guests book a private room. Please notify the property in advance to ensure that a dog friendly room is allocated. Free parking, Wi-Fi, and linens are included and towels are available for hire.